We may be a bit biased around here but spring is our favorite color season. Who doesn’t love a good lilac, an understated pink or a dusty blue? Join us all March long while we celebrate spring with tutorials, inspiration, kits, crafts and color displays all influenced by our love of spring! Here are a few of our favorite floral shades to get you in the spirit. Lush green grassy hues combine for a nearly perfect green felt. Somewhere between purple and pink you’ll find sweet pea. A lovely periwinkle blue toned wool blend felt. A bold and vibrant orange felt. American Felt and Craft has just reached 25,000 pinterest followers. Thank you all for all you have done to support our small company. We are SO honored to be your source for inspired felt ideas and high quality supplies! Meet our newest arrival, Spring Supper! I created this felt food pattern with the goal of making it as interactive as possible. The result is a ham that can be dressed and sliced, potatoes that can be baked, deviled eggs with removable filling, stacking jello salad, and decorative lettuce leaf accents. This mammoth pattern also features felt steamed asparagus, hot cross buns, a coconut cake, pineapple slices and a simple but impressive felt pan pattern. This pattern was truly a labor of love and like all proud parents I feel the need to show you a ridiculous amount of pictures. This adorable little felt ham only measures 5″ x 7″ x 5.5″ to perfectly fit into play ovens and pretend kitchens. It was based on the vintage style pineapple hams of the 1950’s. The pint size play ham features slices attached with hook and loop for a fun slicing action. Pull up a chair and grab a plate. The felt pineapple slices are attached with colored hook and loop and come off with ease for hours of culinary play. The scalloped potatoes and asparagus are perfectly portioned for sharing! Deviled eggs with removable fillings make the perfect pre-dinner appetizer. Felt asparagus nestled into a felt pan makes a healthy and fun felt side dish. Of course my absolute favorite part of this tutorial e-book is the felt jello salad. Felt Jello has been on my sewing bucket list for quite some time and I went through at least a dozen prototypes before I was happy but I think it was all worth it. The felt food jello pieces all stack and can be made from any color of the rainbow. See more of our latest felt food pattern and save on ALL our PDF patterns this week only! Bamboo felt is made from bamboo rayon and a standard rayon blend making it the softest felt available. 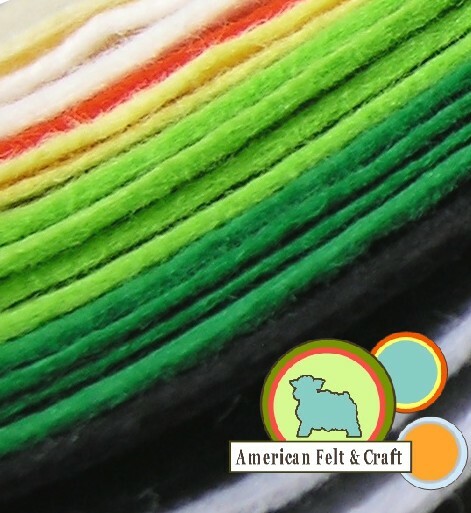 We just added a big selection of bamboo felt fabric available by the quarter yard to our online shop American Felt and Craft. First on our trek Black Pearl bamboo felt a light charcoal black with a velvety feel and smooth drape. While typical wool blend felt absorbs light bamboo rayon blend subtly reflects it for a truly unique finish. Up next Coral Reef a deep ruddy orange bamboo felt just shy of terra cotta. Right around the color we have a sweet bold lilac shade. Island Orchid is a vibrant pale lavender bamboo felt with a satiny finish. The biggest difference in bamboo felt vs wool or wool blend felt is that bamboo felt is much more plush , has a soft pearly sheen and a more delicate drape. It can be used the way you would any other felt. Lemon yellow bamboo felt is vibrant, dynamic and drapes like a dream. Made from bamboo rayon fibers bamboo felt is a great vegan felt option for those with wool allergies. Macaw Red Bamboo felt definitely has a coral pink sheen to it, a truly beautiful felt. The fibers in bamboo make for a kaleidoscope of felt colors that are particularly lush and vibrant! Moon shadow bamboo felt is a dusty off white with a pale gray undertone and a subtle sheen. Like all felts bamboo felt won’t fray so every last scrap can be used. 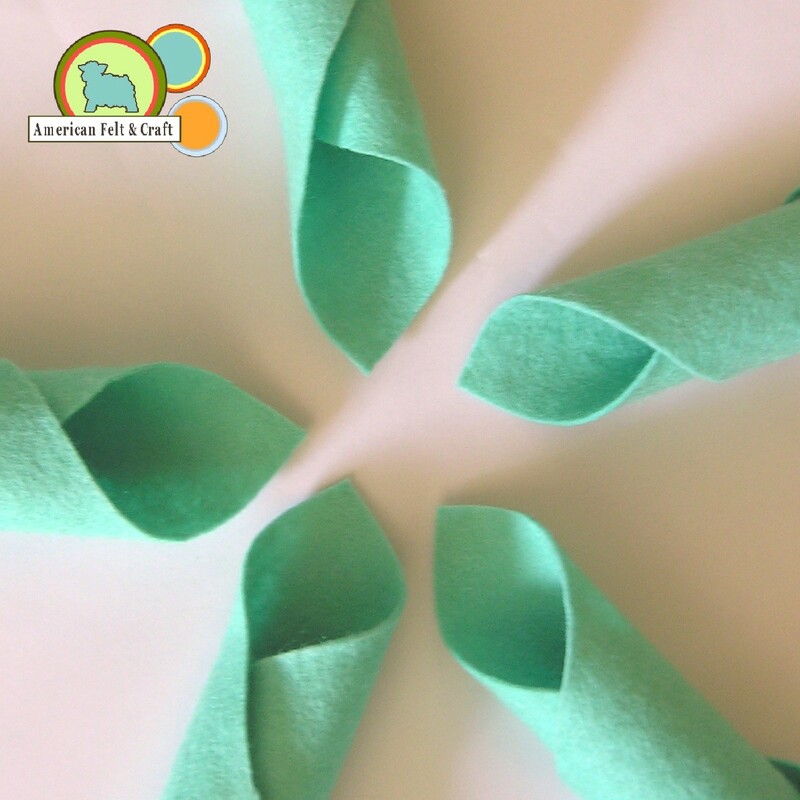 My new favorite is this soft aqua bamboo felt fabric. Ocean Breeze is a vivid and silky bright blue felt. Papaya is a strong firey orange bamboo felt made from vegan fibers. Bamboo felt has a soft and luxurious feel. Pirate Cove is a bright spring green bamboo felt fabric. Bamboo felt is 100% natural and made from sustainable fibers. Next on our tour is Pina Colada a bright truely white bamboo felt. Bamboo felt cuts and handles beautifully. Sand Dollar is a lovely pale beige neutral felt perfect for a variety of DIY craft projects. Soft AND Strong bamboo felt is sure to last. is Available by the quarter yard. And last but not least is Seashell Pink a delicate sugary pink bamboo felt. Stop into our shop and check out our new bamboo felt friends. Selecting the perfect felt color online can be tough that’s why American Felt and Craft is adding multiple shots of every color we carry…and they are really pretty. Pop on over to Americanfeltandcraft.com and look for the sheep logo in the corner to see all the colors we’ve updated so far! Crinkle Material for Baby and Pet Toys now in stock! Our search for a high quality CPSIA and EN71 compliant crinkle material (often called crinkle paper or baby paper) has taken years, literally. Well simply finding out where to buy crinkle material used in baby and pet toys, was quite difficult. Once we found a supplier many of the samples we ordered broke down in the washer, lost crinkle or couldn’t hold a stitch. But most importantly we knew any crinkle material we carried had to be CPSIA and EN71 safety standard complaint making it safe for use in crinkle toys. We finally found everything we were looking for with this commercial quality crinkle material, – made for a major toy manufacturer and sold exclusively for resale to us- perfect for loveies, stuffies, blankies, and toys. And knowing it meets CPSIA and EN71 standards will allow everyone to sleep well at night! Machine washable, dryer safe, durable and SUPER loud! Crinkle Material left exposed to demonstrate durability. Even safe to iron on low heat!! For maximum crinkle sew your crinkle material down on all sides. Meets EN71 and CPSIA standards for safety. Totally machine washable and dryer safe! Our Crinkle Material won’t shrink, curl, bunch, or lose sound when washed. Commercial strength made specifically for use in toys AFC’s crinkle will withstand vigorous playing. Sold in 11″ x 36″ yards. Contact customerservice@feltandcraft.com for wholesale and bulk orders.